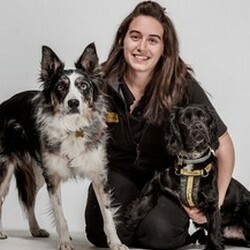 Hi, I am Ella and I am the Supporter Relations Officer for Dogs Trust Loughborough and I offer free talks about the Dogs Trust in Leicestershire, Rutland, Nottinghamshire and part of Derbyshire. I live locally to the centre with my 2 Dogs Trust ex residents – Moss and Brewster. There is no charge for my talks, but a donation would be nice….. I use a power point presentation with plenty of photographs of our four legged friends. I can bring a dog with me depending on the group size and time of the meeting, but they always steal the show! My talks are about Dogs Trust, our history, present and future aspirations. Not only this but I can offer day time talks and also evenings. I make no charge, but a donation is always most welcome – I travel within Leicestershire, Rutland, Nottinghamshire and part of Derbyshire. I talk about the history and work of Dogs Trust and can speak for 30 mins or up to an hour if required. Questions are always welcome. I can bring a dog with me, they always steal the show!